It’s unclear when my dry eye actually began. During my annual eye exam one year I remember the doctor saying I had a “little bit of dry eye,” but as it didn’t bother him, it had no meaning to me. Sure, my eyes felt dry and itchy staring at computer screens, TV and reading, but it wasn’t pain; I just thought they were tired. During a photography vacation, I felt a very painful rip in my eye. Upon returning home and visiting the eye doctor he said I had torn my cornea, probably as a result of dry eye. (Really? Why hadn’t we been trying to prevent this?) He further said I had recurrent corneal erosion disease (RCE) and the only way to treat it is to keep the eye moist so it doesn’t happen again. He specified one specific over-the-counter drop I was to use 3-4 times/day and was clear to use nothing else. The cornea tear did heal (8-12 weeks, but that’s another story), and I was highly motivated to keep the eye moist. I faithfully used the drops he recommended despite an increasing burning feeling. I visited the eye doctor for other reasons, but after about a year I returned because the burning was intense and incessant. I am amazed how quickly I dropped into suicidal ideation. This burning was completely unacceptable. My life was in shambles. Before all this I lived to be outdoors and hiking, I loved photography, travel, camping, road trips (usually alone), reading and watching TV. Now each and every one of those things was very painful. Going to the store was painful – even walking through the store and the wind that generated was painful. Driving was dangerous; I wanted my eyes closed half the time! Before I would read for hours; now it hurt after 5 minutes. Just going outside was so painful to my eyes. If this was what the rest of my life was going to be like, I did not want to go on. Back at the eye doctor, he said nothing was wrong with my cornea and if it hurt, just keep applying those drops – every 5 minutes if I needed to. I was already using them every 15-30 minutes, and each application burned. Fortunately, we were also discussing cataract surgery and he said we would let this calm down before attempting cataract surgery. That was the only word I heard of hope; this was not eternal, but could “calm down.” He gave me no hint of how to achieve that, but it was possible. Lesson #1: do not rely solely on the doctor. Research, experiment and find my own answers. A corollary: if the doctor isn’t helping, find a doctor who will. Lesson #2: yes, my life is now different. I can either stop doing the things I love, or find a way to adapt. I’m learning to adapt. Through the advice of dry eye sufferers on DryEyeZone, I learned of many things to try. I got a pair of moisture chambers which allow me to go outside (!! ), drive and read. I adapted my hiking hat to become more like a bonnet allowing me to block wind from my eyes when needed. Experimenting with different eye drop brands helped me find the ones that work best for me. Experimenting with diet helped me find foods to avoid. DRINK TONS OF WATER; that is now the first thing I try when the eyes feel uncomfortable. I have learned air pollution hurts my eyes causing symptoms like an allergic reaction (over-watering, mucus) and have put air purifiers in each room of my home and put the AirVisual app on my phone (to learn the air quality where I am). I have learned my eyes love Caribbean islands and Florida and even the wind there does not hurt them. I have learned wildfire smoke is the worst! I have learned eyelid hygiene makes a difference and warm compresses feel heavenly. What caused this? Only God knows. It could be because I’m a woman past menopause; it could be because I wore hard contacts in my 20’s hours longer than I should have; it could be my career of staring intently and intensely into computer screens for years; it could be because of my thyroid, etc, etc. No idea. I dismiss genetic because no known person in my family tree has this. Today (and I literally mean today), my eyes are in a good place. It’s not permanent. It’s taken 2 years to get here. But I feel good about life, about my eyes, and about my future. A special shout out to Rebecca at The DryEyeShop who was especially helpful and supportive at a bad time in my life. You rock!!! A special shout out to the Dry Eye Talk group on Facebook. It’s a wonderful community who are not perfect, but who are there, supportive and eager to help. Me enjoying life again. My husband joins me at Avalanche Lake in Glacier NP. This shows my adapted hiking hat with flaps up. 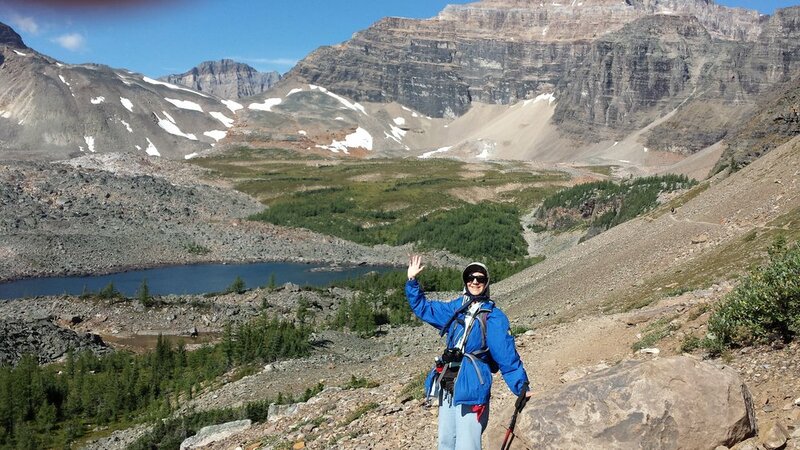 Me with adapted hiking hat with flaps down (near Lake Louise in Canada). In winter, eastern humid, mild mountains. In summer, high elevation, dry, intense sun, lots of wind.